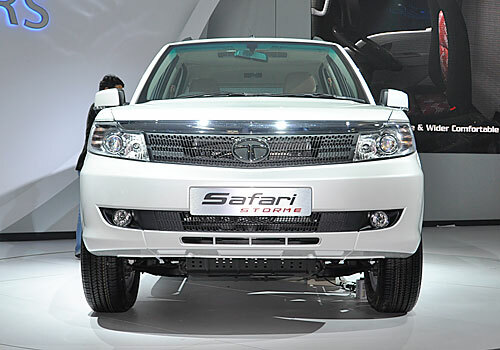 The soon to be launched 2012 Tata Safari Storme is one of the most enthusiastically awaited SUV in the Indian car market. The main reason is that the older Tata Safari carries a very good reputation in the market since many years. There are a lot of expectations from this latest SUV and the company has not left any stone unturned to make it a winner. Tata Safari Storme price in the country is estimated to be around Rs. 10 lakh (approximate ex-showroom price New Delhi). The moment you set your eyes on this powerfully built SUV, it is sure to make your heart skip a beat instantly. The smooth and lustrous body line is very enticing with the front fascia having a very formidable look to it. The radiator grille is broad and looks fearsome, which has the luminous head lights that are fitted with xenon powered lamps. The front bumper has a pair of gleaming fog lamps to augment the visibility in the dark. The sides are neat with smart ORVM’s with side indicators and body colored door handles adding to its tidiness. While the rear end is enhanced by adding a spoiler and a trendy tail lamp cluster and the roof rails on top adding to the stylishness of this stately SUV, all of which is clearly visible in the Tata Safari Storme pictures. Also the mounted spare wheel at the back has been shifted below the SUV to give it a trimmed look and it will also feature dual exhausts as well. According to a Tata Safari Storme review, Tata Motors have taken utmost care to fill this SUV with all the advanced and state of the art comfort and safety features. These features are only adding up to the hype and expectations of the customers impatiently waiting to take one of these SUV’s soon. The standard safety features include airbags, traction control, ABS and EBD with brake assist and ESP as well with central remote locking and the likes. While an advanced multi information display with a satellite navigation system is also incorporated along with a classy music system for in-cabin entertainment. The engine is a commanding 2.2 litre, DOHC, DICOR diesel mill with 4 cylinders that is cleverly mated with a 5-speed manual transmission gear box. The Tata Safari Storme is overall an affordable SUV, which has been bestowed with advanced and stylish features inside and a majestic and heavily built body structure outside. With the kind of hype and publicity it has already generated, there is nothing which will stop this SUV to climb the ladder rapidly in its segment. Along with this SUV, several other vehicles such as – New Chevrolet Captiva, Renault Duster, Audi Q3, Premier Rio Diesel, New Hyundai Elantra, BMW 3 Series, Volkswagen Jetta petrol and Audi A4 are lined up for their launches in the coming future. I shared Maruti Ertiga arrives with a price tag of Rs.5.89 lakh and Porsche - Incredible 81 Years and Still Running Young.